Not to be confused with the Merck Group (Merck KGaA), a distinct but historically related company based in Germany. Merck & Co. logo used since 1965. Merck & Co., Inc., d.b.a. Merck Sharp & Dohme (MSD) outside the United States and Canada, is an American multinational pharmaceutical company and one of the largest pharmaceutical companies in the world. The company was established in 1891 as the United States subsidiary of the German company Merck, which was founded in 1668 by the Merck family. Merck & Co. was expropriated by the US government during World War I and subsequently established as an independent American company in 1917. While it operates as Merck & Co. in North America, the original Merck based in Darmstadt holds the rights to the Merck name everywhere else. Merck & Co. is the world's seventh largest pharmaceutical company by market capitalization and revenue. Its headquarters is located in Kenilworth, New Jersey. The company ranked No. 78 in the 2018 Fortune 500 list of the largest United States corporations by total revenue. Merck & Co. publishes The Merck Manuals, a series of medical reference books for physicians, nurses, technicians, and veterinarians. These include the Merck Manual of Diagnosis and Therapy, the world's best-selling medical reference. The Merck Index, a compendium of chemical compounds, was formerly published by Merck & Co. before being acquired by the Royal Society of Chemistry in 2012. Merck & Co. traces its origins to its original German parent company Merck, which was established by the Merck family in 1668 when Friedrich Jacob Merck purchased a drug store in Darmstadt. In the 19th century, the Merck company in Darmstadt evolved from a pharmacy to a major pharmaceutical company which pioneered the commercial manufacture of morphine. In 1891, family member George (Georg) Merck emigrated to the United States and set up Merck & Co. in New York as the US subsidiary of the family company. Merck & Co. operated from 1891 to 1917 as the US subsidiary of the Merck Group. After the U.S entered World War I, the Merck Group's US subsidiary Merck & Co. was confiscated under the Trading with the Enemy Act of 1917. Company head George W. Merck purchased back the stock in 1919, but U.S. Merck remained a separate company from its former German parent. Merck & Co. hold the trademark rights to the "Merck" name in North America, while its former parent company retains the rights in the rest of the world. In 1929, H. K. Mulford Company merged with Sharp and Dohme, Inc. This company brought to the future Merck & Co., Inc. vaccine technology, including immunization of cavalry horses in World War I and delivery of a diphtheria antitoxin in 1925. In 1953, Merck & Co. merged with Philadelphia-based Sharp & Dohme, Inc., founded by Alpheus Phineas Sharp and Carl Friedrich Louis Dohme in 1845, becoming the largest US drugmaker. The merger combined Merck & Co.'s strength in scientific research and chemical manufacturing with Sharp & Dohme's sales and distribution system and its marketing expertise. The combined company kept the trade name Merck in the United States and Canada, and as Merck Sharp & Dohme (MSD) outside North America. In 1965 Merck & Co. acquired Charles E. Frosst Ltd. of Montreal, Quebec, Canada (founded 1899) and created Merck-Frosst Canada, Inc., as its Canadian subsidiary and pharmaceutical research facility. Merck & Co. closed this facility in July 2010, and the company was renamed Merck Canada in 2011. In November 2009, Merck & Co. announced that it would merge with competitor Schering-Plough in a US$41 billion deal. Although Merck & Co. was in reality acquiring Schering-Plough, the purchase was structured on paper as a "reverse merger", in which "Old" Merck & Co. was renamed Merck Sharp & Dohme, and Schering-Plough renamed as "Merck & Co., Inc." so that it could, technically, continue as the surviving public corporation. The maneuver was an attempt to preserve Schering-Plough's rights to market Remicade, which was ultimately decided by arbitration. The merger was completed on November 4, 2009. As of 2015[update], Merck Sharp & Dohme remains a subsidiary of the Merck & Co. parent. As of December 2013, the US company had approximately 76,000 employees in 120 countries with 31 factories worldwide. It is one of the world's seven largest pharmaceutical companies. The Merck Company Foundation has distributed more than $480 million to educational and non-profit organizations since it was founded in 1957 (and $740 million in overall charitable distributions). On December 7, 2012, the foundation announced that it was ending its donations to the Boy Scouts of America because of "its policy that excludes members on the basis of sexual orientation", which "directly conflicts with the Merck Foundation's giving guidelines". In October 2013, Merck & Co. announced it would cut 8,500 jobs in an attempt to cut $2.5bn (£1.5bn) from its costs by 2015. The company's shares rose 2.35% to US$48.73 in New York trading after it announced the cuts. The new losses, combined with 7,500 job cuts announced in 2011 and 2012, amount in total to 20% of its workforce. In June 2014 Merck & Co. announced its acquisition of Idenix Pharmaceuticals for approximately $3.85 billion. In December 2014 Merck & Co. announced they would be spending $8.4 billion to buy Cubist Pharmaceuticals. Later in the same month the company acquired the Swiss biotechnology company OncoEthix for up to $375 million dependent upon certain milestone achievements. In July 2015 Merck & Co. and Ablynx expanded their 18 month old immuno-oncology collaboration by four years, generating a potential $4.4 billion in milestone payments for the Abylnx. Days later Merck & Co. announced it would spend $95 million up front on collaborating with cCAM Biotherapeutics and its lead candidate (an early-stage treatment similar to Keytruda). The company is due up to $510 million more, which is tied to clinical, regulatory and commercial milestones. Merck & Co. will bring in CM-24, an antibody designed to block the immune checkpoint CEACAM1. In January 2016 Merck & Co. announced two new partnerships; the first with Quartet Medicine and its small molecule pain treatments, the second with Complix investigating intracellular cancer targets, with both collaborations potentially generating up to $595 million and $280 million respectively. Days later the company announced it would acquire IOmet Pharma, with IOmet becoming a wholly owned subsidiary of Merck & Co. The acquisition includes IOmets IDO (indoleamine-2,3-dioxygenase 1), TDO (Tryptophan 2,3-dioxygenase), and dual-acting inhibitors. In June, the company announced its acquisition of Afferent Pharmaceuticals for $1.25 billion, gaining Afferents lead compound - AF-219 - used to block P2X3 receptors. In April 2017, Merck Animal Health acquired Brazilian animal health product manufacturer, Vallée S.A.. In September, the company announced it would acquire Rigontec for $554 million - acquiring Rigontec's lead compound RGT100 which targets the retinoic acid-inducible gene I pathway. In February 2018, Merck announced it would acquire Australian viral cancer drug company, Viralytics for AUD$502 million ($394 million), boosting Merck's own pipeline. In December, the company announced it would acquire Antelliq Group for $2.4 billion ($3.7 billion including debt). In February 2019, the comapany announced its acquisition of Immune Design Corp for nearly $300 million ($5.85 in cash per share), gaining access to its immunotherapy programs. In 191 of 193 countries, the original Merck company, the Merck Group of Darmstadt, owns the rights to the "Merck" name. In the United States and Canada, the company trades under the name EMD (an abbreviation of Emanuel Merck, Darmstadt). In the United States and Canada, Merck & Co. holds the rights to the trademark "Merck", while in the rest of the world the company trades under the name MSD (an abbreviation of Merck, Sharp & Dohme). In 2015 the Merck Group adopted a new logo and said it will be "much more aggressive" about protecting the brand of "the real Merck". Merck of Darmstadt has initiated litigation against its former subsidiary, Merck & Co. (MSD) of Kenilworth, in several countries over infringing use of the Merck name. In 2016, the High Court of Justice in the United Kingdom ruled that MSD had breached an agreement with its former parent company and that only Merck of Darmstadt is entitled to use the Merck name in the United Kingdom. The judge also held that MSD's use of "Merck" as part of branding on its global websites were directed to the UK and infringed Merck's trade mark rights in the UK. In response to the ruling, MSD initiated counter-litigation in the United States in January 2016 by filing a federal lawsuit which accused its former parent company of "infringing on its trademark" through actions that included the increased usage of “Merck KGaA” and “MERCK” in branding in the US as well as on its social media presence. Further Merck & Co. has also accused the Merck Group of federal trademark dilution, unfair competition, false advertising, deceptive trade practices, breach of contract, and cybersquatting. The case came to a head when a research scientist believed he was communicating with Merck & Co regarding a research grant in oncology, when in fact they were talking with the Merck Group. As a result, Merck & Co. asked the federal court to stop the Merck Group from using “Merck” on any products or marketing materials in the United States. As a direct result, Merck & Co is seeking “all monetary gains, profits, and advantages” made by the Merck Group and three-times the damage, plus additional punitive damages. (Founded 1891 as a subsidiary of Merck of Darmstadt. In 2005, CEO Raymond Gilmartin retired following Merck's voluntary worldwide withdrawal of Vioxx. Former president of manufacturing Richard Clark was named CEO and company president. Clark retired in October 2011 and Kenneth Frazier became CEO. On April 23, 2014, Robert M. Davis, formerly CFO of Baxter International, became Merck's CFO. Davis replaced Peter N. Kellogg, who held the post from 2007. Januvia (sitagliptin), a dipeptidyl peptidase IV inhibitor for the treatment of type 2 diabetes. In 2013, Januvia was the second largest selling diabetes drug worldwide, with $4.0 billion in worldwide sales. Januvia is commonly paired with the generic anti-diabetes drug metformin. It has been popular due in part because unlike many other diabetes drugs, it causes little or no weight gain and is not associated with hypoglycemic episodes. Merck also sells a single pill combination drug containing both Januvia and metformin under the trade name Janumet. There has been some concern that treatment with Januvia and other DPP-IV inhibitors may be associated with a modestly increased risk of pancreatitis. Zetia (ezetimibe) is a drug for hypercholesterolemia that acts by inhibiting the absorption of dietary cholesterol. Sales in 2013 amounted to $2.7 billion. Zetia has been controversial, as it was initially approved based on its impact on serum cholesterol levels without proof that it actually impacted the incidence of cardiovascular disease. Results of the IMPROVE-IT study, however, introduced at the 2014 Scientific Sessions of the American Heart Association, showed a statistically significant, albeit modest, benefit in adding Zetia to simvastatin for high-risk, post-acute-coronary-syndrome patients. Remicade (infliximab) is a monoclonal antibody directed toward the cytokine TNF-alpha and used for the treatment of a wide range of autoimmune disorders, including rheumatoid arthritis, Crohn's disease, ankylosing spondylitis, plaque psoriasis, and others. Remicade and other TNF-alpha inhibitors exhibit additive therapeutic effects with methotrexate and improve quality of life. Adverse effects include increased risk of infection and certain cancers. 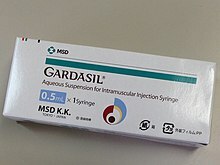 Gardasil (recombinant human papilloma virus vaccine) is a vaccine against multiple serotypes of human papilloma virus (HPV), which is responsible for most cases of cervical cancer worldwide. Isentress (raltegravir) is a human immunodeficiency virus integrase inhibitor for the treatment of HIV infection. It is the first anti-HIV compound having this mechanism of action. Sales in 2013 were $1.8 billion. It is part of one of several first line treatment regimens recommended by the United States Department of Health and Human Services. Keytruda (pembrolizumab) is an immune modulator for the treatment of cancer. On September 4, 2014, the US Food and Drug Administration (FDA) approved Pembrolizumab (MK-3475) as a breakthrough therapy for melanoma treatment. In clinical trials, pembrolzumab provided partial tumor regression in about one quarter of patients, many of whom have not seen further progression of their disease in over 6 months of follow-up. Invanz (Ertapenem) is an injectable antibiotic, rights to which Merck has owned since 1999. As of 2015, Merck was in a legal dispute with the Taiwanese company Savior Lifetec over their attempt to secure rights to sell a generic version of this drug in the United States. In 2018, Merck began the submission process for a Biologics License Application to the U.S. Food and Drug Administration (FDA). The application was for an investigational vaccine, called V920, to fight the Zaire strain of the Ebola virus. V920 "falls under the FDA’s Breakthrough Therapy Designation. It is intended to expedite the development of a candidate that can treat a serious or life-threatening condition when preliminary clinical evidence indicates that the drug may demonstrate substantial improvement over existing therapies . . ."
Medically important vaccines developed at Merck include the first mumps vaccine, the first rubella vaccine, and the first trivalent measles, mumps, rubella (MMR vaccine), each of which was developed by Merck scientist Maurice Hilleman. The incidence of rubella-associated birth defects fell from up to 10,000 per year in the U.S. to zero in the aftermath of the rubella vaccine's development. Hilleman also developed the first Hepatitis B vaccine and the first varicella vaccine, for chickenpox. The thiazide diuretics were developed by scientists Karl H. Beyer, James M. Sprague, John E. Baer, and Frederick C. Novello of Merck and Co. in the 1950s, and led to the marketing of the first drug of this class, chlorothiazide, under the trade name Duiril in 1958. The research leading to the discovery of chlorothiazide, leading to "the saving of untold thousands of lives and the alleviation of the suffering of millions of victims of hypertension" was recognized by a special Public Health Award from the Lasker Foundation in 1975. Merck scientists also developed lovastatin, the first drug of the statin class. It was marketed under the trade name Mevacor. Streptomycin, discovered during a Merck-funded research program in Selman Waksman's laboratory at Rutgers University in 1943, became the first effective treatment for tuberculosis. At the time of its discovery, sanitoriums for the isolation of tuberculosis-infected people were a ubiquitous feature of cities in developed countries, with 50% dying within 5 years of admission. Although Merck's agreement with Rutgers gave it exclusive rights to streptomycin, at Wakman's request the company renegotiated the agreement, returning the rights to the university in exchange for a royalty. The university then set up non-exclusive licenses with seven companies to ensure a reliable supply of the antibiotic. In 1985 Merck received approval for imipenem, the first member of the carbapenem class of antibiotics. Antibiotics of the carbapenem class play an important role in treatment guidelines for certain hospital-acquired and multi-drug resistant infections. In 1999, the U.S. Food and Drug Administration (FDA) approved Vioxx (known generically as rofecoxib), a Merck product for treating arthritis. Vioxx was designed as a selective inhibitor of the enzyme cyclooxygenase-2. Such compounds were expected to cause less gastrointestinal bleeding than older anti-inflammatory drugs such as naproxen, which were associated with 20,000 hospitalizations and 2000 deaths each year. [non-primary source needed] Vioxx became one of the most prescribed drugs in history. Thereafter, studies by Merck and by others found an increased risk of heart attack associated with Vioxx use when compared with naproxen. Merck adjusted the labeling of Vioxx to reflect possible cardiovascular risks in 2002. About 50,000 people sued Merck, claiming they or their family members had suffered medical problems such as heart attacks or strokes after taking Vioxx. In November 2007, Merck agreed to pay $4.85 billion to settle most of the pending Vioxx lawsuits. The settlement required that claimants provide medical and pharmacy records confirming the occurrence of a heart attack, ischemic stroke, or sudden cardiac death; the receipt of at least 30 Vioxx pills within 60 days prior to the injury or death; and confirmation of Vioxx being used within 14 days of the Vioxx-related event. The settlement was generally viewed by industry analysts and investors as a victory for Merck, considering that original estimates of Merck's liability reached between $10 billion and $25 billion. In fact, as of mid-2008, when the plaintiff class had reached the threshold percentage required by Merck to go through with the settlement, plaintiffs had prevailed in only three of the twenty cases that had reached juries, all with relatively small awards..
Merck has refused to consider compensation for Vioxx victims and their families outside the US. This is particularly true in the UK where there are at least 400 victims and the legal protection afforded to the victims and their families is particularly weak. According to internal e-mail traffic released at a later lawsuit, Merck had a list of doctors critical of Vioxx to be "neutralized" or "discredited". "We may need to seek them out and destroy them where they live," wrote an employee. A Stanford Medical School professor said that Merck was engaged in intimidation of researchers and infringement upon academic freedom. On May 20, 2008, Merck settled for $58 million with 30 states alleging that Merck engaged in deceptive marketing tactics to promote Vioxx. All its new television pain-advertisements must be vetted by the Food and Drug Administration and changed or delayed upon request until 2018. In 1987, Merck & Co. began a program with UNICEF to donate its new drug Mectizan to "all that need it for as long as needed" in an effort to combat onchocerciasis, also known as river blindness, primarily in Africa. Up to that point, the World Health Organization had fought the disease through the use of insecticides to lower the population of its primary vector, the Black Fly. However, when studies in the 1980s showed how effective the drug was at treating and preventing the disease, the WHO agreed to use it instead of its previous strategies. Merck's involvement is considered a key factor in the success against the disease all over the world, and the decision to donate the entirety of the drug to all those in need of it is used as part of the Mectizan Donation Program that covers countries such as Yemen and African countries. More than 700 million people have been treated since the inception of the program with 80 million people still undergoing treatment in Africa, Latin America, and Yemen. Blindness caused by onchocerciasis is decreasing, and there are regions of Latin America and Africa that have been shown to have completely eliminated the disease altogether. Fosamax (alendronate) is a bisphosphonate used for the treatment of post-menopausal osteoporosis and for the prevention of skeletal problems in certain cancers. The American College of Clinical Endocrinology, the American College of Obstetricians and Gynecologists, the North American Menopause Society and the UK National Osteoporosis Guideline Group recommend alendronate and certain other bisphosphonates as first line treatments for post-menopausal osteopotosis. Long-term treatment with bisphosponates produces anti-fracture and bone mineral density effects that persist for 3–5 years after an initial 3–5 years of treatment. Alendronate reduces the risk of hip, vertebral, and wrist fractures by 35-39%. In December 2013, Merck agreed to pay a total of $27.7 million to 1,200 plaintiffs in a class action lawsuit alleging that the company's osteoporosis drug had caused them to develop osteonecrosis of the jaw. Prior to the settlement, Merck had prevailed in 3 of 5 so-called bellwether trials. Approximately 4000 cases still await adjudiction or settlement as of August 2014. Merck & Co. was one of the first American pharmaceutical companies to offer assistance to those unable to afford its medications, beginning a program in the 1950s. Merck & Co. offers seven patient assistance programs, each with specific eligibility requirements. Following the merger with Schering Plough in 2009, Merck started laying off workers, cutting around 36,450 jobs between 2010 and 2015. During that time the company sold its consumer health business to Bayer and narrowed the company's focus to immunology, vaccines, diabetes, emerging markets and medicines used in hospitals, like certain antibiotics. From 2002 through 2005 the Australian affiliate of Merck paid Elsevier an undisclosed amount to publish eight issues of a medical journal, the Australasian Journal of Bone and Joint Medicine. Although it gave the appearance of being an independent peer-reviewed journal, without any indication that Merck had paid for it, the journal actually reprinted articles that originally appeared in other publications and that were favorable to Merck. The misleading publication came to light in 2009 during a personal injury lawsuit filed over Vioxx; 9 of 29 articles in the journal's second issue referred positively to Vioxx. In 2009, the CEO of Elsevier's Health Sciences Division, Michael Hansen, admitted that the practice was "unacceptable". Merck and the Wellcome trust jointly fund the Hilleman Laboratories, an India-based non-profit research organization dedicated to the development of low-cost vaccines for use in developing countries. Current projects include the development of low cost, thermostable vaccines for the prevention of cholera, rotavirus, and meningitis. A US Justice Department fraud investigation began in 2000 when allegations were brought in two separate lawsuits filed by whistleblowers under the False Claims Act. They alleged that Merck failed to pay proper rebates to Medicaid and other health care programs and paid illegal remuneration to health care providers. On February 7, 2008 Merck agreed to pay more than $650 million to settle charges that it routinely overbilled Medicaid for its most popular medicines. The settlement was one of the largest pharmaceutical settlements in history. The federal government received more than $360 million, plus 49 states and Washington, DC, received over $290 million. One whistleblower received a $68 million reward. Merck made the settlement without an admission of liability or wrongdoing. Merck & Co. once used methylene chloride, an animal carcinogen on the United States Environmental Protection Agency's list of pollutants, as a solvent in some of its manufacturing processes. Merck chemists and engineers subsequently replaced the compound with others having fewer negative environmental effects. Merck has also modified its equipment to protect the environment, installing a distributed control system that coordinates chemical reactions more efficiently and expedites manufacturing by 50 percent, eliminating the need for the disposal and storage of harmful waste. Biological oxygen demand has also been reduced. In 1991, Merck's Kelco subsidiary was responsible for volatile organic compound (VOC) emission pollution in the San Diego area. In 1996 Merck paid $1.8 million for polluting the air. New machines were installed to reduce smog emissions by 680,000 lb (310,000 kg) a year. MSD for Mothers is an associated not for profit organisation which supports projects to improve maternal health. ^ a b "US SEC: Form 10-K Merck & Co., Inc". United States Securities and Exchange Commission. Retrieved January 12, 2018. ^ a b Johnson, Linda (2 February 2018). "Tax Overhaul Charge Hands Merck 4Q Loss Despite Higher Sales". Drug Discovery & Development Magazine. Associated Press. Retrieved 2 February 2018. ^ a b c d e f "US SEC: Form 10-K Merck & Co., Inc" (PDF). United States Securities and Exchange Commission. Retrieved 31 March 2018. ^ "Contact Us". Retrieved February 11, 2015. ^ "Our History". Retrieved 7 Aug 2014. ^ "Montreal plant among 17 closed by drugmaker Merck". The Star. Toronto. July 8, 2010. ^ a b Merck & Co., Inc. (27 Feb 2014). Merck & CO, Inc 2013 FORM 10-K (Report). ^ "Merck & Co. completes Medco purchase". November 19, 1993. Retrieved January 14, 2014. ^ "Merck finally spins off Medco Health to shareholders". USAToday. August 20, 2003. ^ "Express Scripts and Medco Health Solutions Complete Merger; Will Address National Mandate for More Affordable, Higher Quality Healthcare". PRNewswire. April 2, 2012. ^ Singer, Natasha (March 10, 2009). "Merck to Buy Schering-Plough for $41.1 Billion". The New York Times. Retrieved 2009-11-14. ^ "Notice of Reorganization Event". November 12, 2009. Retrieved 2009-11-13. ^ Edwards, Jim (November 10, 2009). "Merck Legally Changed Its Name 3 Times to Achieve Reverse Merger With Schering". CBS News. Retrieved 2012-09-02. ^ Merck's News Release: Merck and Johnson & Johnson Reach Agreement on Distribution Rights for Remicade and Simponi Archived 2012-07-08 at the Wayback Machine, April 15, 2011. Retrieved 2012-09-03. ^ a b c Jeffrey, Jeff (25 August 2015). "Merck sues Taiwan company over generic antibiotic product". Triangle Business Journal. Retrieved 2015-08-26. ^ "Foundation » Merck Responsibility". Merck Responsibility. Retrieved 3 July 2015. ^ "Princeton University and The Merck Company Foundation Announce Creation Of New Global Health Scholars Program and Lecture Series" (PDF). Retrieved 2012-06-05. ^ "Merck cuts another 8,500 jobs". BBC News. October 1, 2013. ^ "Merck acquires Idenix". Genetic engineering & biotechnology news. June 9, 2014. ^ Rothwell, Steve. "Merger Momentum to Continue in 2015, EY Says". abc news. Retrieved 9 December 2014. ^ "Merck Buys OncoEthix for up to $375M". GEN.
^ "Ablynx, Merck & Co. Ink $4B+ Expansion of Immuno-Oncology Collaboration". GEN.
^ "Merck signs a $605M deal to bulk up in cancer immunotherapy". FierceBiotech. ^ "Quartet, Merck Partner on Pain Treatments in Up-to-$595M Alliance". GEN.
^ "Merck & Co. Launches Up-to-$280M Cancer Collaboration with Complix". GEN.
^ "Merck & Co. Acquires Cancer Immunotherapy Developer IOmet". GEN.
^ "Merck & Co. to Acquire Afferent Pharmaceuticals for Up to $1.25B - GEN News Highlights - GEN". ^ "Merck Animal Health Completes Acquisition of Vallée S.A. - Merck Newsroom Home". www.mercknewsroom.com. ^ "Phase I/II Trial of Intralesional Administration of RGT100 - Full Text View - ClinicalTrials.gov". ^ "Merck to Acquire Rigontec, Expanding Cancer Immunotherapy Franchise". ^ "Today's Stock Market News and Analysis from Nasdaq.com". ^ "Legal Wrangle Pits Merck vs. Merck". GEN.
^ Rubin, Ben Fox (2011-10-06). "Merck Chairman Clark To Retire; CEO Frazier to Take Over". Wall Street Journal. Retrieved 24 November 2015. ^ a b "Merck Replacing CFO with Baxter Exec". Drug Discovery & Development. United States of America: Advantage Business Media. Associated Press. March 27, 2014. Archived from the original on March 29, 2014. ^ Kinch MS, Haynesworth A, Kinch SL, Hoyer D (August 2014). "An overview of FDA-approved new molecular entities: 1827-2013". Drug Discov. Today. 19 (8): 1033–9. doi:10.1016/j.drudis.2014.03.018. PMID 24680947. ^ "The top 10 best-selling diabetes drugs of 2013 - FiercePharma". ^ Zhan M, Xu T, Wu F, Tang Y (August 2012). "Sitagliptin in the treatment of type 2 diabetes: a meta-analysis". J Evid Based Med. 5 (3): 154–65. doi:10.1111/j.1756-5391.2012.01189.x. PMID 23672222. ^ Deacon CF, Mannucci E, Ahrén B (August 2012). "Glycaemic efficacy of glucagon-like peptide-1 receptor agonists and dipeptidyl peptidase-4 inhibitors as add-on therapy to metformin in subjects with type 2 diabetes-a review and meta analysis". Diabetes Obes Metab. 14 (8): 762–7. doi:10.1111/j.1463-1326.2012.01603.x. PMID 22471248. ^ Li L, Shen J, Bala MM, et al. (2014). "Incretin treatment and risk of pancreatitis in patients with type 2 diabetes mellitus: systematic review and meta-analysis of randomised and non-randomised studies". BMJ. 348: g2366. doi:10.1136/bmj.g2366. PMC 3987051. PMID 24736555. ^ "AHA: IMPROVE-IT Proves Ezetimibe Benefit". MedpageToday. November 17, 2014. ^ Aaltonen KJ, Virkki LM, Malmivaara A, Konttinen YT, Nordström DC, Blom M (2012). "Systematic review and meta-analysis of the efficacy and safety of existing TNF blocking agents in treatment of rheumatoid arthritis". PLoS ONE. 7 (1): e30275. doi:10.1371/journal.pone.0030275. PMC 3260264. PMID 22272322. ^ "Merck Melanoma Drug Is First PD-1 Inhibitor OK'd by FDA". GEN. Retrieved 3 July 2015. ^ "Merck nears approval of experimental Ebola vaccine - Homeland Preparedness News". Homeland Preparedness News. 2018-11-21. Retrieved 2018-11-30. ^ "Mumps — History of Vaccines". ^ "Rubella — History of Vaccines". ^ "1971-MMR Combination Vaccine Debuts". ^ "1981-Hepatitis B: First Subunit Viral Vaccine in U.S."
^ "Merck History". Retrieved 2014-09-22. ^ Antibacterial Agents. Chemistry, Mode of Action, Mechanisms of Resistance, and Clinical Applications. Anderson RJ, Groundwater PJ, Todd A, Worsely AJ. Wiley (2012). ISBN 9780470972458 See Preface material. ^ Tansey, E.M.; Reynolds, L.A., eds. (2000). Post-Penicillin Antibiotics: From Acceptance to Resistance? (PDF). A Witness Seminar held at the Wellcome Institute for the History of Medicine, London. London: Wellcome Trust. ISBN 978 184129 012 6. ^ Fries JF, Miller SR, Spitz PW, Williams CA, Hubert HB, Bloch DA (February 1989). "Toward an epidemiology of gastropathy associated with nonsteroidal antiinflammatory drug use". Gastroenterology. 96 (2 Pt 2 Suppl): 647–55. doi:10.1016/S0016-5085(89)80061-7. PMID 2909442. ^ Vaithianathan R, Hockey PM, Moore TJ, Bates DW (2009). "Iatrogenic effects of COX-2 inhibitors in the US population: findings from the Medical Expenditure Panel Survey". Drug Saf. 32 (4): 335–43. doi:10.2165/00002018-200932040-00007. PMID 19388724. ^ a b "Merck Agrees to Pay $4.85 Billion in Vioxx Claims". The New York Times. November 9, 2007. ^ "Description of Settlement Agreement" (PDF). Vioxx MDL Plaintiffs’ Steering Committee Official Vioxx Settlement. November 9, 2007. ^ Giles, J. (November 2008). "How Merck Made a Killing". Healthy Scepticism. Archived from the original on August 2018. ^ Rout, Milanda (April 1, 2009). "Vioxx maker Merck and Co drew up doctor hit list". The Australian. Retrieved 2009-04-26. ^ "Ivermectin History". Stanford.edu. February 24, 1981. Retrieved 2012-06-05. ^ a b "History". Retrieved 3 July 2015. ^ Eriksen EF, Díez-Pérez A, Boonen S (January 2014). "Update on long-term treatment with bisphosphonates for postmenopausal osteoporosis: a systematic review". Bone. 58: 126–35. doi:10.1016/j.bone.2013.09.023. PMID 24120384. ^ Serrano AJ, Begoña L, Anitua E, Cobos R, Orive G (December 2013). "Systematic review and meta-analysis of the efficacy and safety of alendronate and zoledronate for the treatment of postmenopausal osteoporosis". Gynecol. Endocrinol. 29 (12): 1005–14. doi:10.3109/09513590.2013.813468. PMID 24063695. ^ Gauthier K, Bai A, Perras C, et al. (2012). "Denosumab, Raloxifene, and Zoledronic Acid for the Treatment of Postmenopausal Osteoporosis: Clinical Effectiveness and Harms [Internet]". PMID 24278999. ^ "Merck agrees to proposed $27.7 million settlement over Fosamax lawsuits | Reuters". Reuters. 2013-12-09. ^ a b Staton, Tracy (August 13, 2015). "Merck tallies 36,000 job cuts in 5 years of restructuring". FiercePharma. ^ Singer N (May 13, 2009). "Merck paid for medical 'journal' without disclosure". The New York Times. Retrieved 2009-06-17. ^ "Statement From Michael Hansen, CEO Of Elsevier's Health Sciences Division, Regarding Australia Based Sponsored Journal Practices Between 2000 And 2005" (Press release). Elsevier. May 7, 2009. Retrieved November 20, 2009. It has recently come to my attention that from 2000 to 2005, our Australia office published a series of sponsored article compilation publications, on behalf of pharmaceutical clients, that were made to look like journals and lacked the proper disclosures. This was an unacceptable practice, and we regret that it took place. ^ "Fierce Biotech: Merck JV plans to show up J&J, Sanofi with low-cost cholera vaccine". Retrieved 2015-02-07. ^ a b Johnson, Carrie (February 8, 2008). "Merck to Pay $650 Million In Medicaid Settlement". The Washington Post. Retrieved February 8, 2010. ^ "Merck to Pay More than $650 Million to Resolve Claims of Fraudulent Price Reporting and Kickbacks". US Department of Justice. February 7, 2008. Retrieved 2012-06-05. ^ Silverman, Ed (February 7, 2008). "Merck To Pay $670 Million Over Medicaid Fraud". Pharmalot.com. Retrieved 2012-06-05. ^ "Merck Resolves Federal and State Investigations Related to Certain Past Pricing And Certain Past Sales and Marketing Activities". Merck. February 7, 2008. Retrieved February 8, 2010. ^ "U.S. settles $1.8 million pollution case with Merck and Monsanto | US EPA". Yosemite.epa.gov. Retrieved 2012-06-05. ^ "Donors pledge $1 billion for maternal and child health fund". Reuters. 6 November 2018. Retrieved 6 February 2019. This page was last edited on 12 April 2019, at 06:27 (UTC).